What do I have to do to be exempt from taking remedial classes? You have to demonstrate proficiency in pre-algebra (arithmetic) and elementary algebra. You can do this by scoring at least 45 on the ACT’s COMPASS exam in pre-algebra and at least a 40 on the ACT’s COMPASS exam in algebra. If you have a high enough Regents exams score, SAT score, a high score on the CUNY Mathematics Assessment exam (the test given prior to COMPASS), or if you have earned a BA or BS degree, then you may be exempt from remedial math courses. If you believe that you ought to be exempt for one of the above reasons, but this does not appear on your transcript, you should go to the Testing Office (S103) . You are generally not exempt from remediation just because you previously passed a remedial course at another college or in high school. I already passed an arithmetic or algebra class in high school or at another college. Do I still need to take a remedial math class at BMCC? If you passed a math course in arithmetic or elementary algebra in high school or at another college, this is not enough to make you exempt from having to take these courses at BMCC. You will have to take the COMPASS placement exam to determine whether or not you will need to take MAT 008, 012, or 051 at BMCC (or you will need to show that you are exempt because of Regents or SAT scores, or because you already have a BA or BS degree – see “Do I have to pass the COMPASS placement exam or pass remedial courses in order to be exempt from remediation?” above). If, however, you passed an intermediate algebra and trigonometry course at another college, you may be exempt from MAT 056 at BMCC; if this is the case, bring a copy of your transcript from that institution with you and show it to a deputy chair of the Mathematics Dept (N599). Are there any opportunities to take remedial courses outside of the regular semester course offerings? Yes. The Immersion Program offers free workshops during the summer and January intersession in which students can meet their remedial requirements. The qualifications for admission into this program change frequently and therefore it is a good idea to check with Dean Gillespie’s office about the qualifications for upcoming Immersion programs before planning a schedule based on an assumption that remedial requirements will be met in the Immersion Program. Why do I have to take remedial courses? Do I really need to take courses that don't give me any credits toward my degree? If you have been placed into a remedial course, it is because your performance on the COMPASS placement exam indicates that you don’t yet have certain skills that will be required to succeed in a 100-level math course. Remedial courses are offered specifically to help you acquire the skills that you need in order to be successful in college level courses which require mathematics. If remedial courses didn’t exist, you simply wouldn’t be able to take any college level math, science, or economics courses because you wouldn’t have the necessary skills. Remedial courses are your opportunity to develop these skills so that you can successfully take college-level courses, even if you don’t yet have all of the needed skills at the time when you begin your studies at BMCC. Do I need to take a remedial course? For most students, whether or not you need to take a remedial course will depend upon your scores on the COMPASS placement exam, which almost every new student at BMCC must take. If you have a 45 or higher on the arithmetic and 40 or higher on the elementary algebra portions of the COMPASS exam, then you are exempt from the remedial courses MAT 112, and 151. 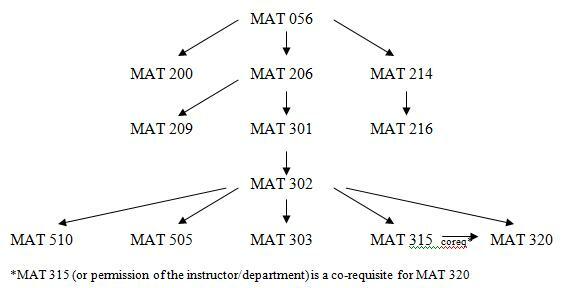 You may, however, need to take MAT 056, depending upon your major. If one or both of your COMPASS scores are below these cutoff scores, then you will be automatically placed into one of the courses MAT 112, or 151; the course into which you have been placed should be indicated on your transcript. If you have a high enough Regents exams score, SAT score, a high score on the CUNY Mathematics Assessment exam (the test given prior to COMPASS), or if you have earned a BA or BS degree, then you may be exempt from remedial math courses, without having to take the COMPASS placement exam. If you believe that you ought to be exempt for one of the above reasons, but this does not appear on your transcript, you should go to the Testing Office (S103) . I just finished MAT 051 (or I am exempt from remedial math classes). What math class do I take next? If you are exempt from MAT 051, you are eligible to take any 100-level mathematics course. Most students do not need to take the additional remedial course MAT 056, Intermediate Algebra and Trigonometry. However, if you want to pursue a math-intensive program (either here at BMCC or at some future institution), you need to be exempt from MAT 056 before taking Pre-calculus (MAT 206) or Discrete Mathematics (MAT 200) or higher level courses such as Calculus. You should check the requirements of your major to see exactly which math courses will fulfill the requirements. Which course is “best” to fulfill the Liberal Arts mathematics requirement? What are each of these 100-level courses about? There are three 100-level courses for liberal arts majors: MAT 100, MAT 150, and MAT 160. All three courses are considered to be the same level of difficulty; the fact that 150 and 160 are higher numbers than 100 does not indicate a higher level of difficulty. MAT 100, Fundamentals of Mathematics I: This course explores the basic structures of mathematics, focusing on conceptual thinking rather than extensive calculation. Students who enjoy constructing arguments and abstract and theoretical approaches to ideas should take this course. Some students find this course easier than previous math courses they’ve taken because it doesn’t involve extensive or complicated calculations; other students find this course harder than previous math courses they’ve taken because it demands the ability to think more theoretically. This is also a good course for students interested in becoming teachers or majoring in education at a 4-year college. MAT 150, Introduction to Statistics: This course is an introduction to statistics, focusing on methods used to analyze collections of real world data. This course requires a certain comfort level with large collections of data, more complicated mathematical expressions, and lots of repeated calculations; some sections of this course will require students to use computers to perform calculations. Students also have to be comfortable correctly applying mathematical concepts to complicated real world situations. Some students enjoy this course because it really tackles and analyzes real world problems which they can connect with; other students find this course difficult because it involves many calculations and because applying mathematics to real world problems can be more complicated and nuanced than strictly theoretical mathematical principles. MAT 160, Quantitative Reasoning: This course is good for students who are interested in looking at a variety of real world applications. This is a good course for students who do not have a strong motivation for taking MAT 100 or 150. It is the best course for students who are interested in seeing more of a broad overview of how mathematics might be applied in many real life situations. I’m planning to transfer to one of the CUNY senior colleges. Which mathematics courses should I take? You should always check with the math department at the senior college to find out for certain which courses will transfer, as transfer policies can change and can depend upon a your future course of study at the senior college. However, most of BMCC’s mathematics courses transfer within CUNY. There are just a few exceptions as noted below. But before registering for any course, you should always check with your advisor; you can also look at the online TIPPS web page for the most recent transfer information. I’ve already studied higher-level mathematics in high school or at another college. Can I place out of MAT 056, MAT 206, etc.? In order to take 200-level courses, you must pass or place out of MAT 056, Intermediate Algebra and Trigonometry. You will NOT be automatically tested for MAT 056 when you are admitted to the college; if you have previously taken an intermediate algebra course in high school and you believe that you already know the material covered in this course, you can go to the Math Lab in S511 to schedule the MAT 056 placement test. If you pass this placement test, then you will be eligible to take all 200-level mathematics courses except MAT 209, Statistics. If you have passed an intermediate algebra course at another college, you may be able to be placed in MAT 206, Pre- Calculus, directly without taking the placement test; you should see the math department chairperson or a math department deputy chairperson for placement. In order to take MAT 209, Statistics, or any 300-level mathematics course, you must also pass or place out of MAT 206, Pre-Calculus. If you have taken a precalculus course in high school and believe that you have mastered the material covered in that course, you can go to the Math Lab in S511 to schedule the MAT 206 placement test. If you pass this placement test, then you will be eligible to take MAT 209, Statistics, or MAT 301, Calculus I. If you have passed a college precalculus course, you should receive transfer credit for MAT 206; to receive transfer credit, you should see the math department chairperson or a math department deputy chairperson. If you have taken one of the AP Calculus exams and received either a 3, 4, or 5, and you would like to be placed in a higher level mathematics course than MAT 301, Calculus I, you should take a record of your AP scores to one of the deputy chairs of the mathematics department so that you can be appropriately placed and receive appropriate transfer credit. In what order should I take higher-level math courses? What are the prerequisites for each course? Should I take MAT 200 or MAT 206? What are these courses about? Both of these courses are considered to be the same level of difficulty; the fact that 206 is a higher number than 200 does not indicate a higher level of difficulty. MAT 200, Introduction to Discrete Mathematics: This is a course in discrete mathematics, which is appropriate for students interested in computer science, mathematics, business and other fields. This course covers fundamental mathematical concepts and conceptual reasoning, with an emphasis on mathematical ideas that are relevant in our digital age. The course was recently re-designed to ensure that it dovetails with related computer science courses. MAT 206, Pre- Calculus: This is a course in pre-calculus; it is a required prerequisite for all 300-level courses (and MAT 209, Statistics). Any student interested in pursuing a career which requires higher-level mathematics will likely be required to take this course at some point in their studies. What options are available at BMCC for students who want to study more mathematics? BMCC has a mathematics major; if you have strong mathematics skills, you should consider majoring in mathematics. For more information about the mathematics major, talk with the mathematics major advisor. You can also join the BMCC Math Team, which participates in competitions, and the BMCC Math Club, which attends math-related events, hosts math speakers, and discusses mathematical ideas outside of the classroom. What careers require higher-level mathematics? Which mathematics is required? Medicine: If you want to go to medical school, you should plan to take the Calculus sequence of courses through MAT 302. Science and Engineering: If you plan to transfer to a 4-year college and major in science or engineering, you should plan to take the Calculus sequence of courses (MAT 301-303).Computer Science: If you plan to transfer to a 4-year college and major in computer science, you should take Discrete Mathematics (MAT 200). Social Sciences: If you plan to transfer to a 4-year college and major in a social science, you should take Statistics. If you are strong in mathematics, you should take MAT 209; however, if you are less confident in your mathematics skills, you should take MAT 150, Introduction to Statistics.Business: If you are interested in pursuing careers in business should consider taking Statistics (MAT 209) and/or Precalculus (MAT 206) and possibly Calculus, depending upon your future plans.Finance: If you are interested in pursuing careers in finance, you should be take the Calculus sequence (MAT 301-303) and Statistics (MAT 209). What is MAT 012? How is this course different from MAT 008? MAT 012 is a course that combines arithmetic (MAT 008) and elementary algebra (MAT 051). You qualify for this course based on your placement scores (student who fail the arithmetic section of the COMPASS placement exam by just a small margin are placed into this course). After completing MAT 012, you do NOT need to take MAT 051. What is MAT 104 and MAT 109? Does either of these courses count toward the liberal arts degree? MAT 104, Mathematics for Health Sciences and MAT 109, Mathematics for Respiratory Therapy do NOT count towards the Liberal Arts mathematics requirement. These courses may only be taken for Liberal Arts elective credit. MAT 104, Mathematics for Health Sciences: If you are interested in applying to the Nursing or Paramedic programs, you can sign up for MAT 104 because it is a requirement for these programs; however, if you do not transfer into either of these programs, MAT 104 will not count towards the Liberal Arts mathematics requirement, and you will be required to take another mathematics course to graduate. MAT 104 will then be counted as a Liberal Arts elective. MAT 109, Mathematics for Respiratory Therapy: Similarly, if you are interested in transferring into the Respiratory Therapy program, you can sign up for MAT 109 because it is a requirement of that program, but if you a remain Liberal Arts major, MAT 109 will not count towards the Liberal Arts mathematics requirement, and you will have to take another mathematics course to graduate. MAT 109 will then be counted as a Liberal Arts elective. What is MAT 214 and MAT 216? Does either count toward the liberal arts degree? MAT 214 and 216 do NOT count towards the Liberal Arts mathematics requirement. These courses are intended for students who wish to be elementary school teachers. If you are interested in changing majoring in Childhood Education at BMCC or you are interested in transferring to a 4-year education program for students who want to teach elementary school, you should take these courses, but if you are a Liberal Arts major, MAT 214 and 216 will not count towards the Liberal Arts mathematics requirement, and you will have to take another mathematics course to graduate. MAT 214 and 216 will then be counted as Liberal Arts electives. Where can I go to get help with math? The Math Lab: You can go to the Math Lab (S535) any time it is open to get help with any math course. The lab makes available a number of free services to students registered in BMCC math classes. This includes tutoring, which is offered on a drop-in basis. The lab houses a large selection of worksheets as well as make-up tests and retests for many courses. The lab also stocks an extensive collection of computer programs and videos. For more information go to the Math Lab webpage. The Learning Resource Center: The Learning Resource Center offers several kinds of tutoring. For more information, take a look at the Learning Resource Center webpage. In particular, the LRC offers online e-tutoring, where you can submit any questions via email and get a response within 24 hours (or if it is a weekend or vacation, by the next day that classes are in session). To submit a math question to the e-tutors, visit the E-tutoring webpage.